Earlier this year, we headed to Malaysia for our annual trip to visit my parents for Chinese New Year. 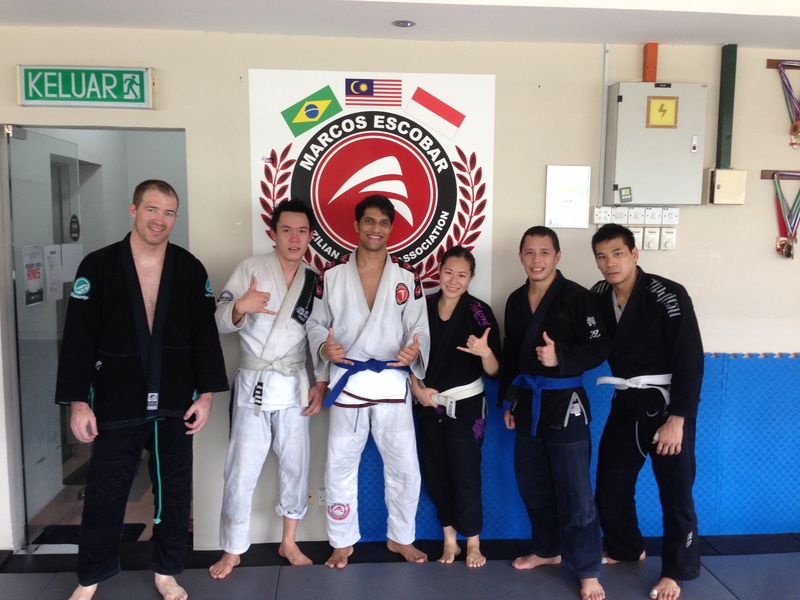 We were in Malaysia for 3 weeks this year and headed back to Leverage Combat Academy to train. As with last year, it was an amazing experience, if anything it was even better this year because we got to attend more classes and got to meet and roll with more people. I learnt a great deal and got some new perspectives to add to my training. A few of the Leverage guys we trained with during our trip. It’s always interesting to hear or learn about how people train BJJ and their philosophies, be it in the way their schools are run, or how they train, or their approach and philosophy of what moves or strategies to pursue while rolling. Quite a while ago, I asked my own coach for advice for which areas of my jiujitsu I should be focusing on or improving. Of course, this was a very general question and so my coach offered me this insight: He said that as a small and not very strong person in the gym, I’m going to be finding myself on my back a lot and so I should be working on my closed guard. Later on, I was asking advice from another of my instructors as to what strategy I should be pursuing (ie: guard game or top game). His advice was that as a small person, I should be trying to go for top because why would I want to be squished by someone bigger than me? When I was training in Leverage, I was talking to the instructor there and mentioned my difficulties in facing larger opponents. He offered me this advice: As a small person, go for the back. If I have my opponent’s back, I’ve got all my weapons against them and they won’t have any of theirs against me. Three coaches, three different sets of advice or perspectives. 🙂 This is why I love BJJ or martial arts in general. I like all three suggestions and I can understand them all. And I don’t know if its by luck or if its by the way I think or go about my training, it feels like they came at the right times in my training. The first advice: Maintain and focus on closed guard. When I got this piece of advice, I was still feeling very uncertain of what things I knew and I didn’t know what I liked or disliked to do. So when my coach said this, I did notice that I did end up on my back a lot and felt rather useless there. So I started focusing on making sure I got to closed guard. At first it didn’t matter what I did from there, as long as I got my legs around and my guard closed, I felt like I’d won the battle. Of course, it was only natural that I started to feel more comfortable in this position and then started thinking about how to attack from this position. So in that way, it focused my training towards the kind of submissions I like or am able to do from guard. The second advice: Get on top so I don’t get squished. 2013 Pan Pacific Championships, I started in guard but not being able to do what I wanted, I disengaged and managed to get a takedown and worked my way to a top position. This came a little later when I was quite comfortable in guard but starting to realise that sometimes it was hard to do what I wanted to do from guard against someone bigger and stronger than me. So it started me thinking about disengaging, sweeping and also got me to focus more on my top game. 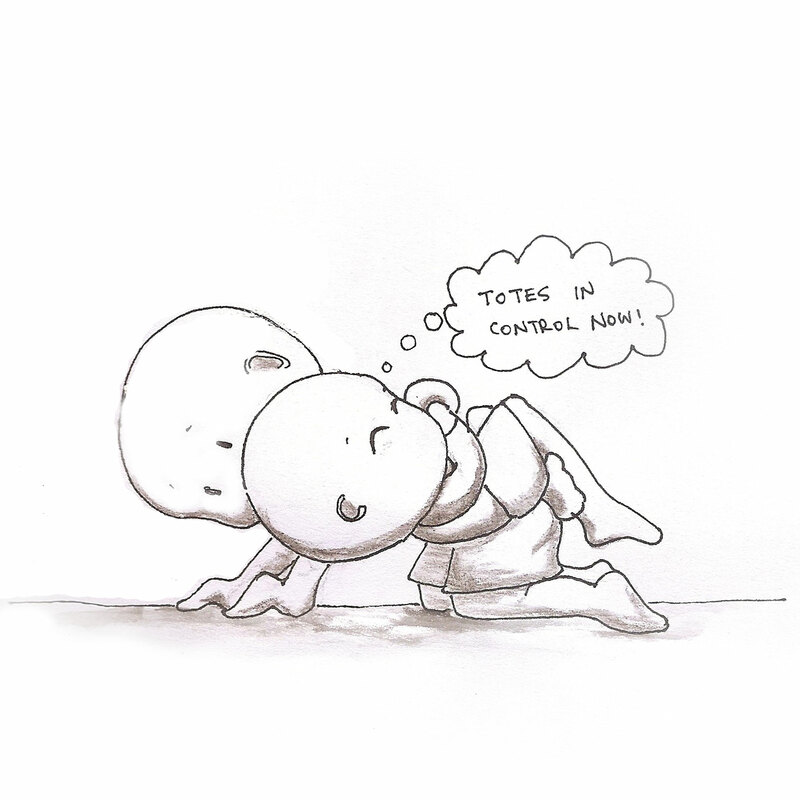 I made new discoveries about how to maintain control from top, particularly against larger opponents and this made me really understand the importance of head control and under-hooks. These were very much transferrable to my guard game too. The third advice: Get on their back. 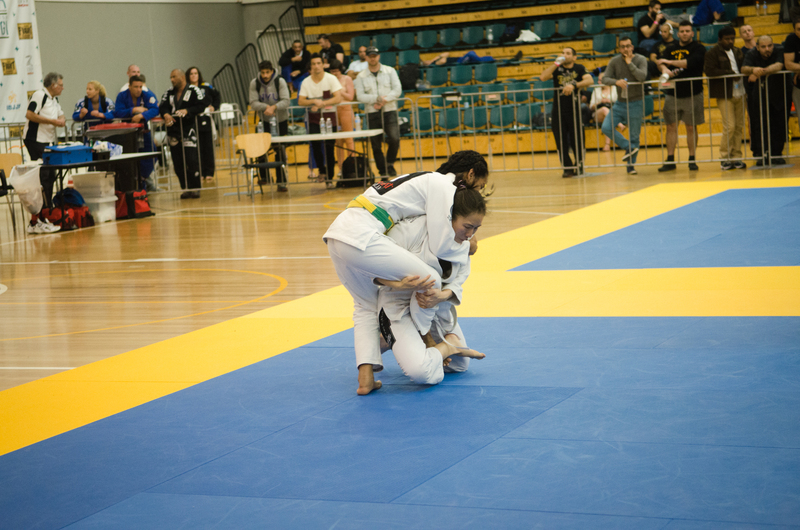 I couldn’t find a photo of myself getting anyone’s back so here’s a photo of how I got my back taken at the 2013 Melbourne Opens. I committed a very stupid and almost fatal mistake of shooting for the wrong leg in my attempt for a single-leg takedown. This only came very recently and I’m still trying to work through this one but I do understand the reasoning behind it. I used to dislike getting back control, especially when I first started jiujitsu. We learned and drilled several basic chokes and I always felt it was impossible. This was when I used to only train in Gi and all those Gi grips would blow my wrist to bits, not to mention trying to drill techniques on my back while someone much heavier than me was lying on me. I just did not feel comfortable and couldn’t understand how it could be such an awesome position when I was getting squished and blowing my short legs out from hooking legs that I could barely reach and wrecking my wrists with uncomfortable Gi grips. If I had been told, just focus on back control way back then, I probably would’ve quit jiujitsu. But now, I’m comfortable and know how to take on weight, I know how to use my leg hooks and I understand the concept of control a lot more so I know how to go about learning to train my back control. I’ve been training Kung Fu for about 10 years now under my instructor, Sifu Julian de Boers and his partner Simo Sophie Archibald. Both of them along with their kids as well as a few of the students who have been training with me for years have become like an extended family to me. When I think of ‘Kung Fu’, I think of family, friendship and a home away from home. For the past year I’ve been putting more focus into my BJJ training and so haven’t been going for Kung Fu as much. When I don’t go for Kung Fu classes, I don’t really miss training as much as I miss my Kung Fu family. Last year for Christmas, I wanted to give Sifu and Simo a present and I knew I wanted to draw them a picture. 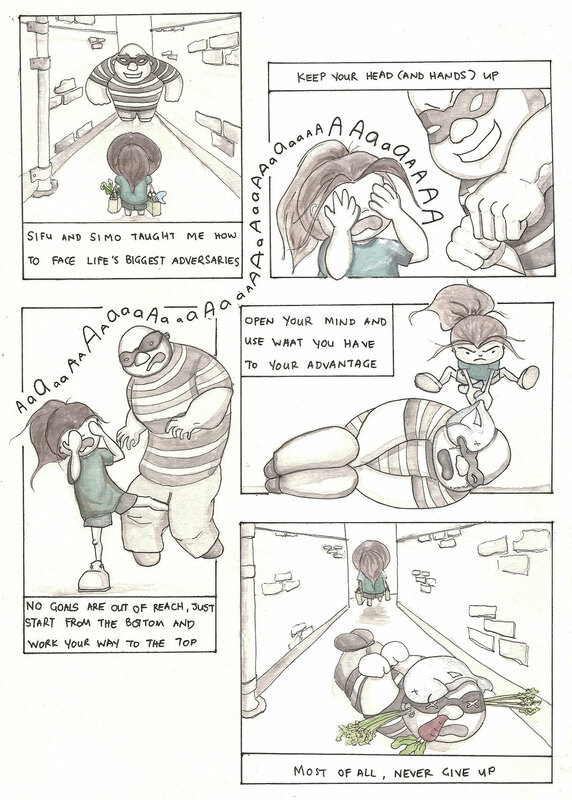 It took a while for me to think up what I wanted to draw but I decided to create a little comic strip for them and I wanted the ‘story’ to be about what they’ve taught me over the years. I love martial arts not just because I love kicking or punching or grappling (all those things are pretty sweet) but I love all the other stuff that comes with it too, like learning about myself or challenging myself or learning to persevere or just learning to learn. It’s been a killer hot week here in Melbourne, with the temperature consistently surpassing 40 deg C (104 Fahrenheit) since Tuesday. Somehow, I’ve managed to drag myself to BJJ training this week by telling myself, “This is nothing compared to what the tennis players are going through at the Australian Open.” At least I’m indoors in the shade while training. I can’t imagine running around in this heat for hours, in the full sun on a hard surface court that’s probably hot enough to cook on! Heat waves are a good time to train your sense of touch and your breathing. So when on the bottom, keep your eyes and mouth closed. This is by far the best defence against getting blinded or choked by your partner’s dripping sweat. If you get yourself stuck in someone’s guard, place your head on their tummy. This will help in your guard pass by making it hard for them to control your posture. But more specifically in this situation, by already having your face on their tummy, you will avoid the inevitable face-plant that will occur when you try to move your legs and discover that the sweat pond under you has rendered the surface as slippery as an ice skating rink. Except worse, because if it were a real ice skating rink, at least it would be nice and cold. 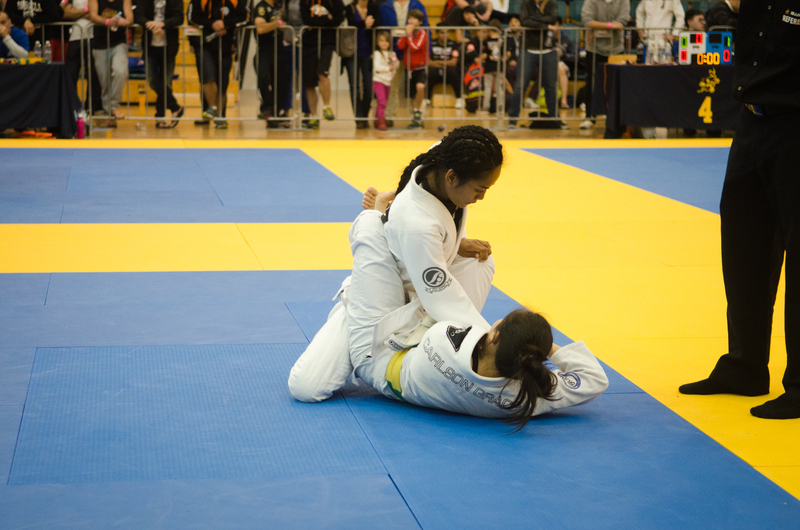 When rolling in no-gi, forget about moves that require you to hold onto your opponent, such as trying to maintain hold on their arm for an armbar. This is impossible and will just result in more sweat on both sides and more exchange of sweat between both sides. Instead, focus on grips where you can hold yourself because in your own mind, you are always the least sweatiest person. 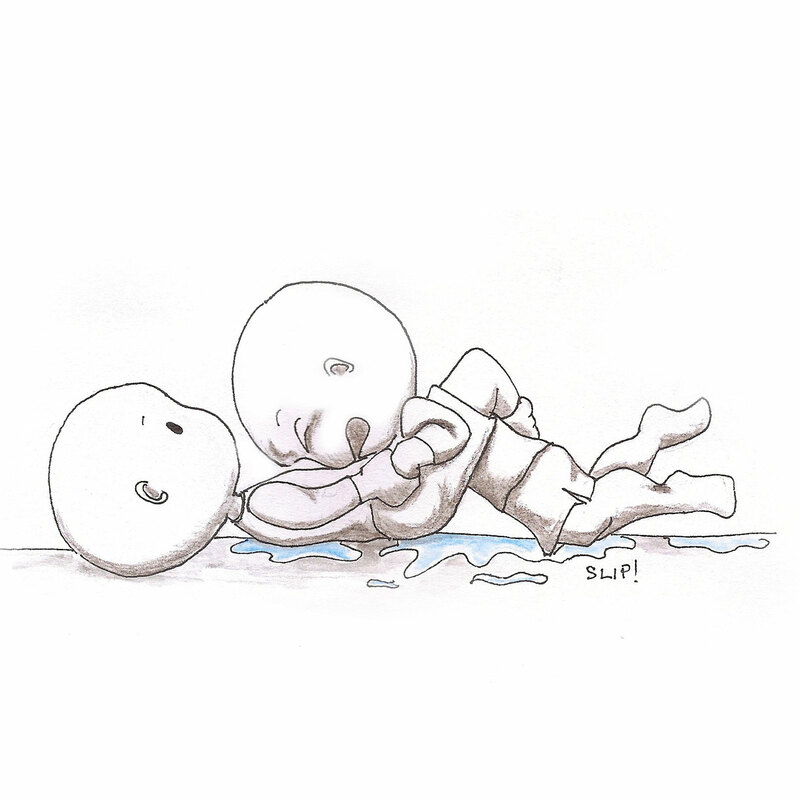 When you’re about to puke from the heat, focus on stabilising your base, calming yourself down and don’t make any sudden movements in case your partner spazzes out and squeezes you in all the wrong places. Focus on breathing through your nose and DO NOT open your mouth! This is especially important when stuck in guard or on the bottom mount or side control. On the other hand, if you must ‘win’, saying “I’m about to puke” goes a long way in getting your partner to back off, letting you escape and then you can immediately capitalise on that situation and gain a dominant position or even a submission. Or you can just puke on them, which will give you the same result. But both options might lead to difficulties in finding partners to roll with for the rest of your training career, so use with caution. After class is done, you might think, “I’m going to cool down so I can stop sweating before changing back into my street clothes.” This is not going to happen, you will not stop sweating forever until you enter an air conditioned environment. 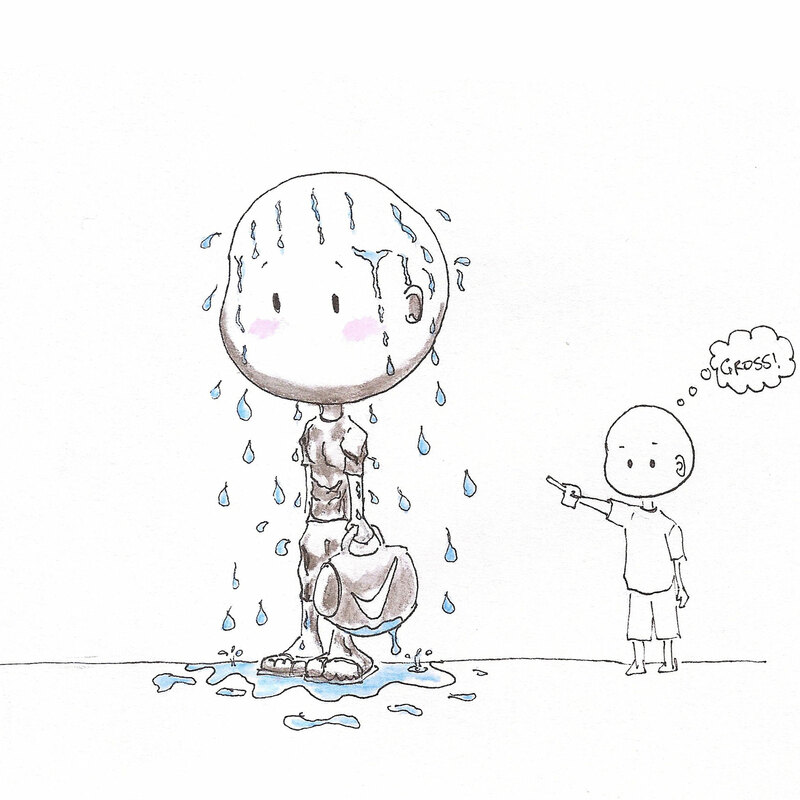 Even a shower will not help because you will just start sweating again right after your shower. So just be prepared for your street clothes to get wet with sweat right away. Bonus Tip: If you’re not dead from exhaustion after rolling in this weather and still want to do some extra work-out, strength training would be the most convenient at this time as you can just use your sweat-laden Gi for weights, it will be the heaviest thing in the world. It’s been a big year for me in regards to martial arts so I wanted to look back on some of the highlights of the year. 1. Starting my Fighting Like a Butter Bee blog: I started this blog as a space to record my thoughts, experiences and memories of all things martial arts in my life. Since my first post in March, I’ve had 4000+ views coming from all over the world, which I’m really happy about. It’s an honour knowing that people are visiting my blog and reading what little I have to say. 🙂 Personally, I’ve found this blog to be a really great space to focus my thoughts and reflect about what I’m learning in martial arts, if only to think up content to write about. It’s made me a more aware and thoughtful martial artist, rather than someone just going through the motions in training. 2. Meeting new martial artists: I’m pretty shy and introverted so I don’t usually put myself in spaces where I meet new people. But happily, I’ve got to meet and know several very cool people out there in the world who share this martial arts common interest with me. Firstly, from my blog I got to meet Julia from jiujiubjj.com and SL from cupcakearmbar.tumblr.com. Through SL, I went to train at her gym in Malaysia (another highlight) and got to meet more cool girls (and boys, but the girls stuck out more :p) who roll in Malaysia. 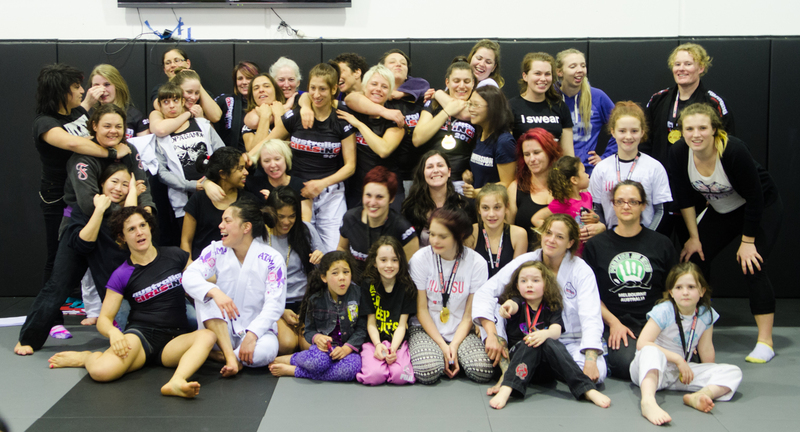 I also joined the Australian Girls in Gi group and through there, I’ve met some very awesome and inspiring ladies. And of course through competitions, I got the chance to talk to and meet my fellow competitors. 3. Training in a new country and gym: I got to visit Leverage Combat Academy in Malaysia and it was a brilliant experience! Can’t wait to head back to visit again in February. There were comps where I was super happy with how I did and there were comps where I felt really disappointed in myself. But each and every one of them, regardless of winning or losing taught me so much about myself physically, mentally and emotionally. Learning is my main purpose in doing martial arts and I think I get the highest spike in learning when I go through the process involved in competing so I’m definitely going to keep on competing. 6. 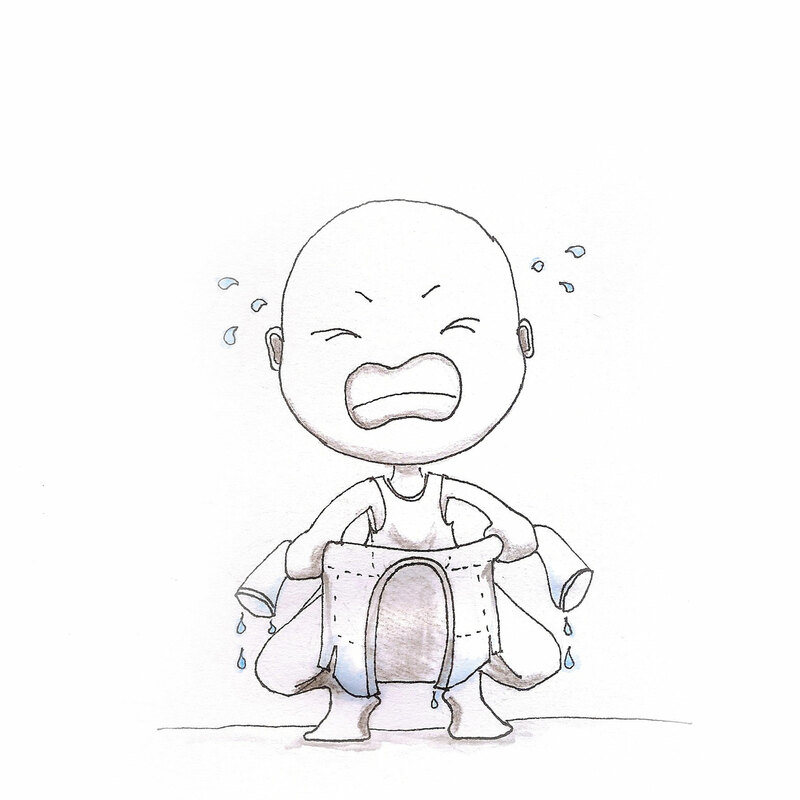 Artworks: To make up for the lack of photos to illustrate my blog posts, I started drawing pictures to post instead. People started expressing interests in my designs and illustrations so I finally got around to setting up a RedBubble shop to sell my works. While it’s still small, I’ve got heaps of ideas for more designs and can’t wait to get around to sharing and showcasing more artworks in the year to come. 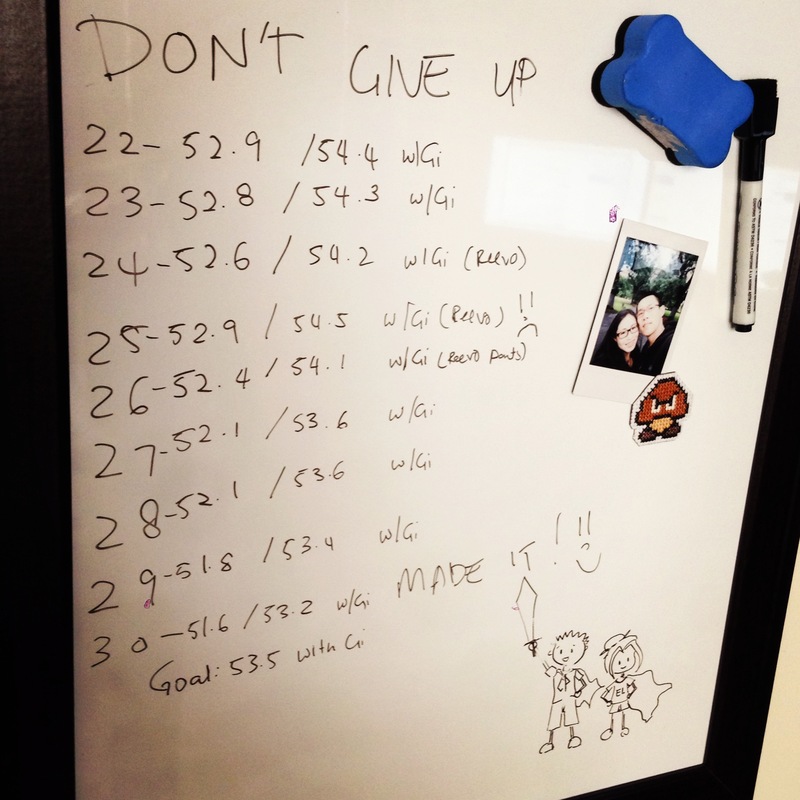 So here’s how I went about cutting down to a lower weight division. I decided to cut to a lower weight division after the Pan Pacs, that was in early October. I had about 6-7 weeks to cut about 5 kg. I can’t remember my starting weight, it was above 56kg thanks to post Pan Pacs feasting. It took a long time before I started seeing the scales go down. 12 days before the competition, I was weighing in about 54.5kg but managed to cut down to 51.6kg on the morning of the competition. 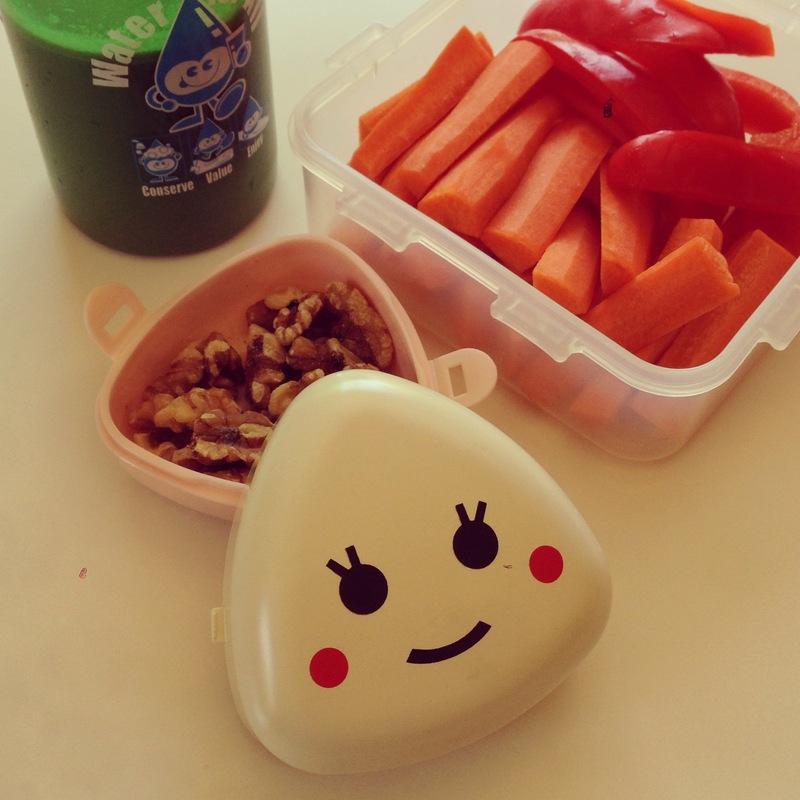 The first thing I did was to start having much smaller portions of food. I pretty much halved my usual amounts of food that I have for lunch and dinner. Of course this left me very hungry a lot of the time as my body wasn’t used to it at first. So for the first few weeks, it was tough but slowly I started getting used to it. I didn’t change what I was eating, just eating a lot less of it. One trick that I used was to change my usual dinner bowl. I usually use this big oversized mug bowl (I like having a cup handle to hold my bowl while eating lol) and I switched it to a small cereal bowl. This way, I could fill up the bowl and it looked like I was having a nice big meal, without actually having a big meal. So instead of a 3/4 full big mug bowl, I was having a 3/4 full small cereal bowl of food, which was about half of my usual amount. Another trick was when eating out, I would put away a portion of the meal first. We tend to eat out on most nights and food portions served are ginormous! My husband and I usually like eating different foods so we always order different things instead of sharing a meal. So to avoid eating up everything that I ordered, when my food arrived, I would pack away about 2/3 to 3/4 of it away in a take away container before tucking in. This way, I could still feel the satisfaction of finishing a meal, rather than trying to control only eating a little bit of one. I was just starting out with a much smaller meal. And the good thing was that there’d be leftovers for meals the next day. I like my milk and cookies late at night but with 5kg to cut, I knew that would have to go. So no more chocolates or cookies or cakes. For a while, I investigated making healthy ‘cookies’ because I was still craving yummy sweet treats. They did help get me by a little but eventually I knew I had to stop those too. I usually train BJJ on Monday, Tuesday, Thursday and Friday, and Kung Fu on Wednesday and Thursday. We also run a weekly Group Fitness Class on Wednesday nights. So in order to cut weight, I knew I had to throw in even more exercise on top of what I was already doing. I started doing skipping at home almost every day. I usually skip for about 35 minutes, some days I would skip for 1 hour and some days when my body was in “Leave me alone” mode, I’d settle for 30 minutes. I also started doing some very light weights daily, like 150 squats, 50 tricep curls and 50 bicep curls with a 7.5kg weight. 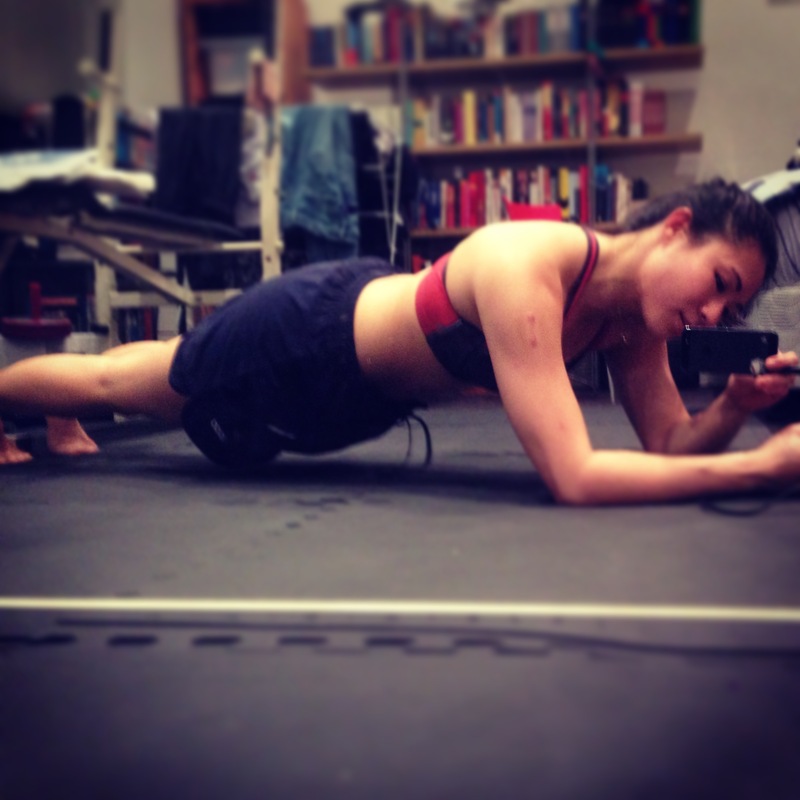 And also some core work like planks and crunches. My main goal for this additional exercise was that I didn’t want to do anything that would cause me to put on too much muscle or make my muscles too sore so I couldn’t train the next day. I was also wary of getting injured in any way because that would stop me from training hard too, so I avoided Kung Fu sparring for a fair while just in case. At every BJJ class, I made sure to try to get in on every single round of rolling to get as much rolling as I could. This wasn’t always possible when classes were really packed but I made sure I got in as much as I could. At 12 days before the competition, I still had about 3 kg to go and it was crunch time! I asked a couple of team mates for advice. I told them how much I needed to cut, what I weighed and how much time I had. They told me to cut out carbs, drink a lot more water, eat a lot more veggies and protein. And I drank a lot of water. Every time I felt a little hungry, I would gulp down a massive cup of water, I like using Ikea’s beer tankard for drinking water. The hardest part of this was all mental. It didn’t help that by nature, I am quite the procrastinator so the first few weeks of weight cutting was all “Hmm didn’t lose much, oh well never mind, I’ll work harder tomorrow”. But from years of being a lazy procrastinator, I do have quite good skills at cramming and setting my brain to Work Mode when I need to. I’m pretty disciplined when it comes to training but I definitely struggled with being disciplined about my diet. The last few weeks was a very rigorous exercise of employing all my mental stamina to keep being disciplined and focused. Having a goal and deadline helped because there was no leeway around it. I had to get to this weight by this time! So that certainly helped in focusing me and not letting me stray. I did start seeing my weight drop off once I started changing my foods. I also don’t think I could have immediately started cutting weight using the diet/exercise regime that I was undergoing in the last 2 weeks. Less than half portions, complete change of foods plus increased exercise would have finished me off. I think the weeks of getting used to small portions really helped so when I had to change the content of my foods, I wasn’t feeling all that hungry and there was no real loss of energy because I was already used to eating less. 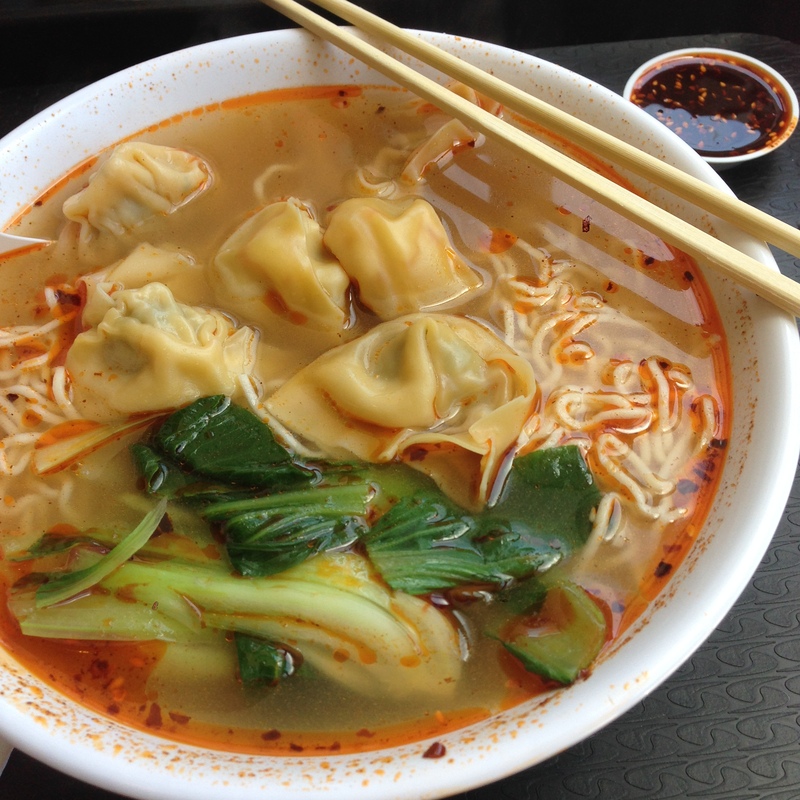 I just had to deal with cravings for sugar and carbs, mainly noodles! In the final 2-3 days, I cut down my water intake so that my body would continue to flush out all the excess water. I didn’t want to do any training on the day before the fight so that I would be well-rested, that meant being ultra diligent with my foods. I made my weight by the skin of my teeth! I weighed in at 53.4kg with my Gi on just before my fight! Everything I fed myself mattered! I have never been so conscious before about what I was eating. I’ve learnt a great deal about food, nutrition, calories and all that. 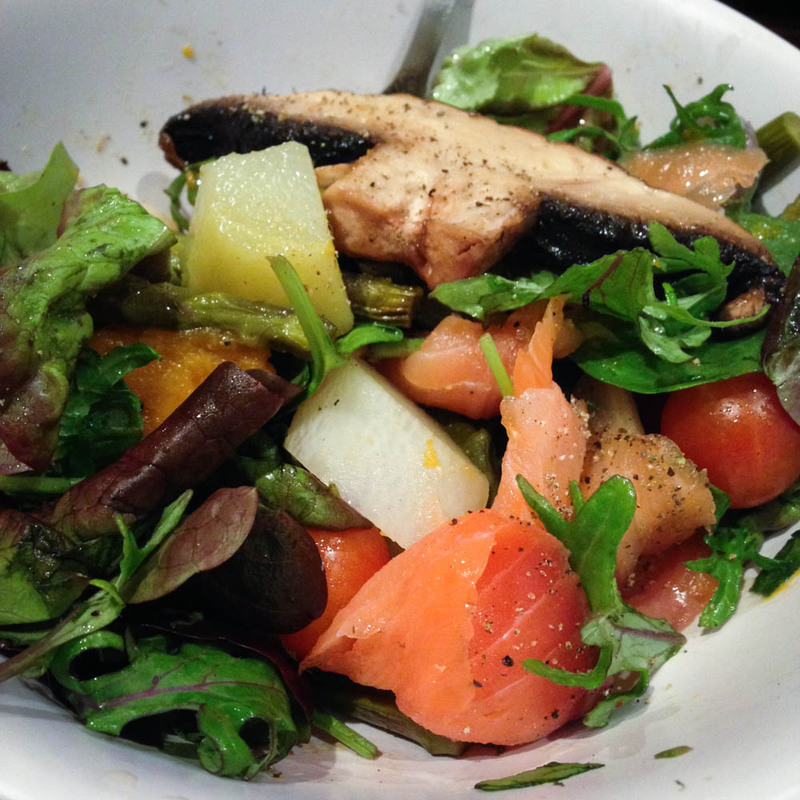 It’s not just about quantity, it was all about quality and it mattered a great deal when I was weighing up between having a little treat that would satisfy my cravings for a little while or having a not so yummy but more nutritious and filling salad that would last longer and meant I could train more. This also comes from going on a major feasting week right after the competition. I have been literally pigging out lately to satisfy all the cravings that I had while cutting weight. While I haven’t been able to eat as much as I used to be able to, the types of food I’ve been pigging out on (heavy carb, heavy sugar) has definitely wreaked havoc on me! While the feasting sessions are oh so pleasurable while I’m doing it, I felt really sick right after! So, while I don’t think my weight cutting diet is something that is sustainable in the long term, I am going to take what I’ve learnt about foods and keep my diet clean, though give myself some freedom to enjoy a bit of gluttony in moderation and reintroduce a small amount of carbs back into my meals. No more hungry training sessions but no more sick, bloaty feelings after eating. 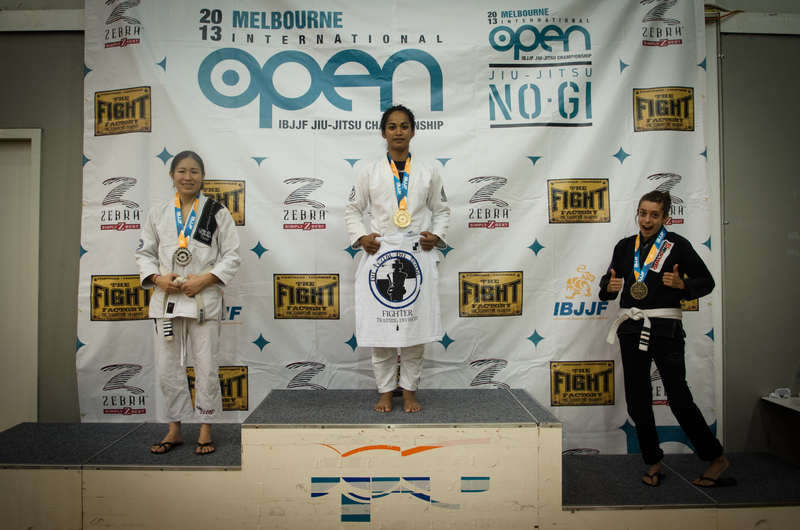 Last weekend, I competed in the 2013 IBJJF Melbourne International Open. I entered the Women’s Adult Light Featherweight Division. There were 3 girls in the division including myself and I got to take home the Silver Medal. First battle of the day was making weight! My division was on at 2.10pm but we got to the venue, which was the Melbourne Sports and Aquatic Centre at around 10.30am. And from then, it was a stressful 4 hours of wondering if I would make weight. This is how paranoid I was about making weight: the day before, I went down to the venue just to check my weight! I found out that there were 2 scales set up, one was the official scales and one was a ‘test’ one that anyone could jump on. The ‘test’ scale was 400g higher than the official scale and I was exactly at the weight limit on the official scale. So I was still worried. I tried to weigh in on the official scale on the morning of my fight but the officials weren’t letting me near the official scale. One told me that the test scale would give me the exact same reading while another said it was 200g higher. For someone who was right on, it was very worrying. And I had cut back on water and food quite a lot the day before so I wasn’t sure I even had anything left in me to cut in the last few hours. Turns out I just made it, weighing it at 53.4kg with my gi on (the cut off was 53.5kg!) Phew! My first fight was against Kayte Hel from Checkmat. I backed off too much at the start and she took me down with an ankle pick. I closed up my guard right away and she stood up to break my guard. I went up with her and nearly got a collar choke on but we were on the side of the mat at the time and the ref stopped the fight to reset us back in the middle. Frustrating but oh well. So we started with Kayte in my guard back on the ground but of course, she wasn’t going to let me have the collar again nor stand up. She had a real solid base and managed to break my guard into half guard. But I couldn’t retain it for long, she had a really sweet knee slide into side control. It felt like I kept getting my half guard back and she’d knee slide right out of it and her points kept piling up lol. In the end she won by points, it was something insane like 17 – 2 I think? I got 2 points for a mount sweep but I couldn’t keep up with her repeated guard passes. That knee slide, wow! My second fight was with Lucy Morris from Maromba, whom I’ve fought before in the AGIG competition. She got me into guard straight away, she was really fast! I managed to pass her guard but it was tough, her leg hooks were really active. I was a good deal heavier than Lucy but she had really good technique, it was hard getting to positions where I could apply a good cross face or flatten her out. Our fight got reset to the middle half way through and this time, I decided to jump guard in case I get stuck in her guard again. 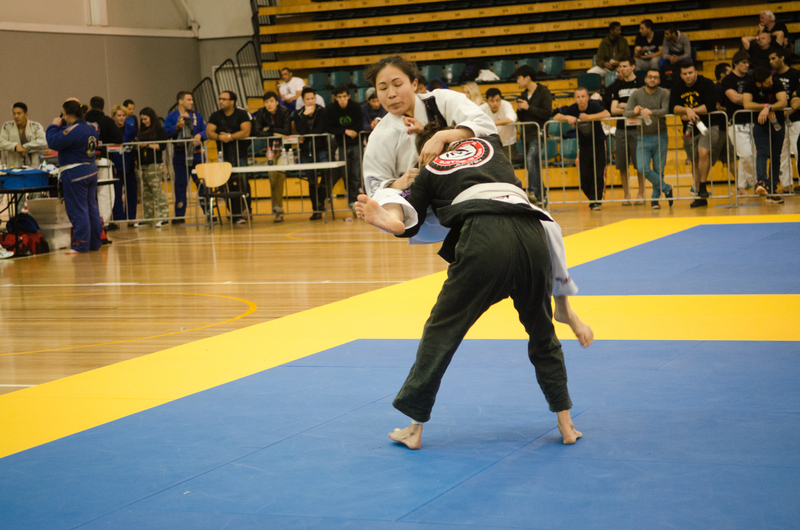 I managed to work myself to mount and got an ezekiel choke and she tapped so I got to fight in the Finals. My final fight was once again with Kayte. This time around I didn’t want her in my guard due to her awesome guard passing so I decided I’d try to go for a takedown. I think it was the right strategy but very poor execution on my part. I wasn’t really thinking about how to shoot, I was just focused on shooting right from the start and ended up shooting for her back leg, which allowed her to get onto my back straight away. Damn! Oh well, lesson learnt. Managed to reverse the position but once again she was in my guard and we started the same game of her passing my guard with her knee slides, lol! At some point, she had mount and went for an arm bar. I was ready for it and turned in time and drove my elbow down to the ground but accidentally left my other arm hanging so she got an omoplata on. I tried to defend the omoplata which went on for a while but she managed to work her arm in for a collar choke at the same time and finally I felt my shoulder was pretty locked up and tapped. Of course, I’d have liked to get the Gold for my team and I was a little sad right after the competition. But after thinking about it, I realised I wasn’t actually all that disappointed with how I went. I definitely felt a whole lot more disappointment at the Vics and the GTA. I think Kayte definitely out-skilled me in every way. After reviewing videos of my fights, I don’t think I was doing anything wrong. Well, no that’s not the right way to say it. Obviously I was doing some things wrong else I would have been able to defend her techniques. Rather, I think I was doing everything right to the best of my current knowledge and skill level. 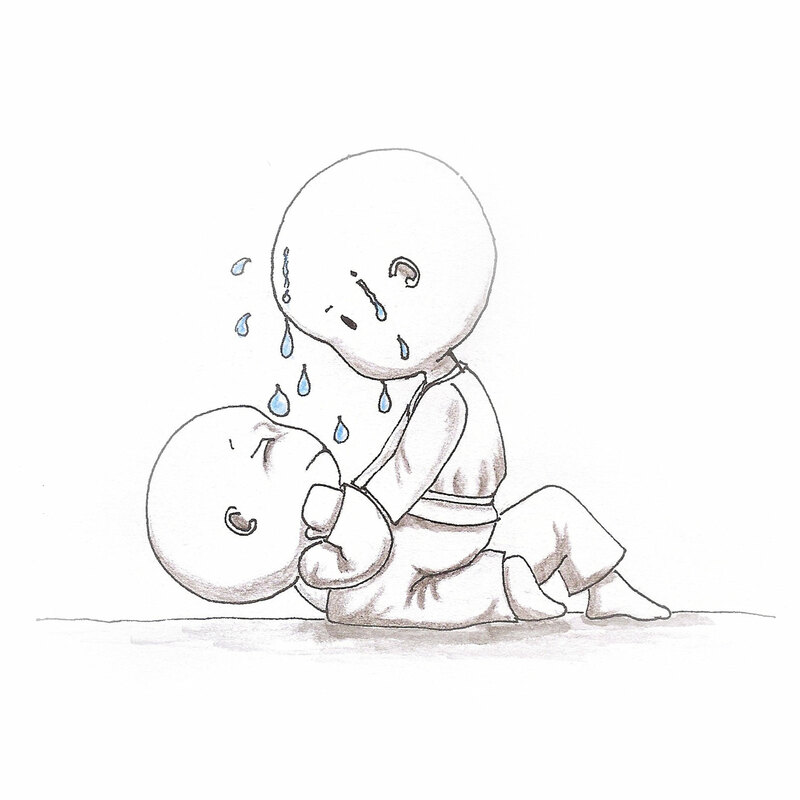 As an example, at the GTA when I was fighting in the Open Weights, I felt so helpless and that really disappointed me because actually I did know techniques to overcome just being stuck in the position I was. But I didn’t do those techniques because I was too cautious about opening my guard or disengaging. This time around, I didn’t feel like I didn’t do something that I should have done. I answered each problem with a solution that I knew to the best of my ability at this point in time. That said, there were still things that I could have done. Not so much in terms of techniques but more mental type things. I could have been a little more aggressive, I could have been a little faster and mentally I could have been more ‘on’. I got a little gassed towards the end in my third round. I’m guessing it’s a combo of having already fought 2 rounds prior plus not having eaten or drank very much for the past 24 hours. At the end of the day, my main goal for entering Melbourne Opens was to drop a weight class and prove to myself that I had the discipline, dedication and mental strength to do so. I made weight and I’m really happy about fulfilling my goal. 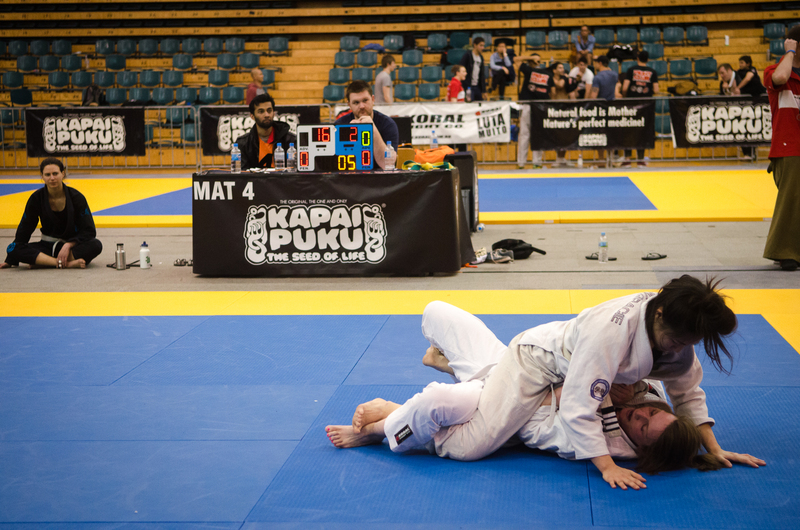 Last night I registered to compete in the 2013 IBJJF Melbourne International Open. I’ll be competing in the Adult Novice Light Feather Weight Division. I decided to cut down from my usual Featherweight division to the Light Featherweight after the Pan Pacs. There isn’t any BJJ-related or competition related reason for this. I don’t think my skills are at a high enough level yet for size and strength to really matter (well not an additional 5kg or so anyway). 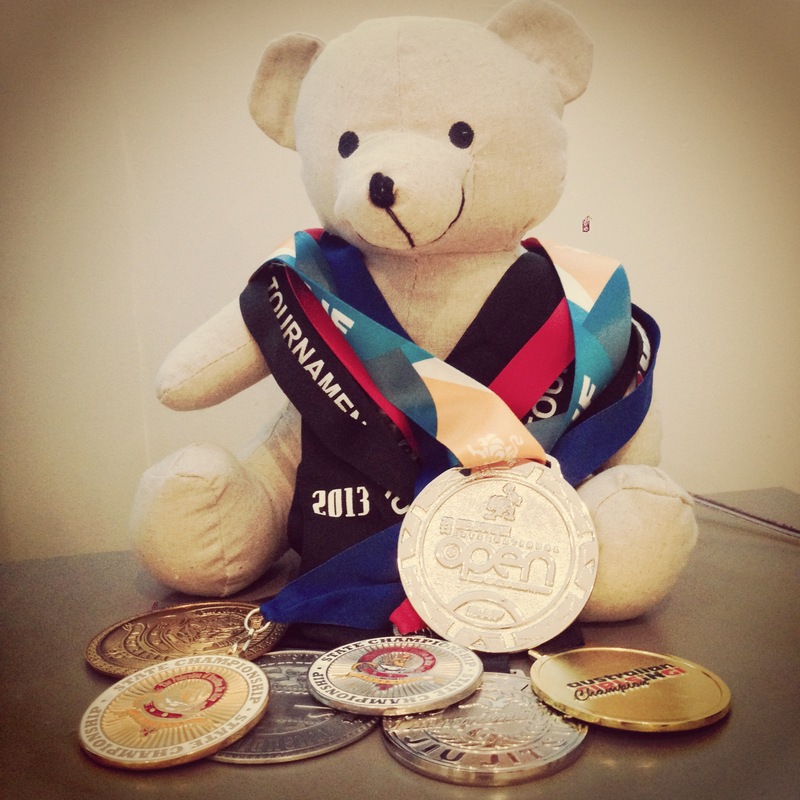 And while I love the focus that competitions give me and I love the experience, I’m not really that hung up on winning or getting medals or doing everything I can to give myself any advantages. I guess the main reason I want to cut down a weight class is that I want to show myself that I can. I’ve been struggling with weight problems for my whole adult life. When I turned 17 and came to Australia, I had no clue about diets or fitness or health, I didn’t even know how much I weighed. The last weight I could remember was in 2001, I was 51 kg after falling really, really ill with a very high fever and I got pretty skinny after that. From then on, it was a downward spiral and the kilograms just started piling on, especially once I started working. I did heaps of overtime work and ate a lot of pizza and take away food and I didn’t have time for exercise (not that i ever did any exercise before anyway). At my heaviest weight, I was once 59kg. Sadly, I was in a lot of denial for most of that time. I caught a lot of flak from everyone and it made me resentful and angry. It’s hard to explain but though I knew I wasn’t some skinny bikini model person, I honestly didn’t see myself as fat. But everyone around me did and had no problems in telling me. It’s really hard and painful getting judged and criticised for my body by everyone whom I loved and whom I thought loved me enough to see past my appearance. And for the life of me, I could not see it as something that they were doing out of love. I had no health issues and I wasn’t obese or even overweight and my fitness while not great at the time was also not bad. So to me, they were doing it purely out of a body image/beauty kind of thing. I don’t want to turn this into too much of an emo blog post so I won’t dwell on this too much, but yes, for years my self esteem and self confidence got whittled down to nothing. Over the years, I’ve read many articles and advice and opinions meant to empower women, that they should be confident in the body that they have and don’t let people judge them over looks. Some say that unless your health is getting affected, don’t change your body. For a long time, I could relate with those kinds of messages. And it made me bitter and angry and resentful at all the people who were judging me based on my body. Anyway, I don’t know what changed in me but I did start seeing my body for what it was. I mean I always knew it was not the best body that I could have but there was still that denial there. But slowly over time, I realised I could do better, I could take care of my body. Maybe it’s age, maybe it’s cause I started doing more training and realising the limitations of my body. I don’t know what it was, but what I do know is that it came from within myself. It wasn’t all the external pressure or the years of people telling me that I’m fat. I know this because for years, I’ve been trying to lose weight because of those criticisms and every time I exercised, I would remember all the hurtful words that was said about my body and so I hated exercising because it just made me really mad at everyone I love. But these days, I don’t feel that anymore. It’s hard to explain and I’m certainly doing a bad job of it lol! But it’s sort of like in the process of training, I started to see that I could do things that other people, no matter how slim or toned or beautiful or perfect their bodies were couldn’t do. Sort of like I started to see myself for my own strengths and that I wanted to push that. One thing I realised about myself is that I don’t give up easily. So I decided I’m going to make that my thing and I want to see how far I can push that and how strong I can be mentally. So anyway, I’m dropping to a lower weight class because I want to prove to myself that I can. And to all the people out there who might be like me, who have been in denial about their weight or bodies, who feel resentful because they’re getting pressured to change, I would like to say this: don’t change if you are totally 100% fine with how your body is, no matter what other people are saying (unless your health is in trouble of course). But if you know deep deep down inside that you could do better, you should do it. Not because your health needs it, or you feel like you need to have some stereotype body or weight. Not because your loved ones are telling you to. All those ‘motivations’ don’t work, at least they didn’t for me. Do it to show yourself that you can. At the moment, I’ve still got a couple of kilograms to go and about 10 days to cut it. I don’t know if I will make it but I’m going to try absolutely everything I can to make it happen. Not because I need to get to that weight (well technically I do need to since I’ve registered and paid!) but because I want to show myself that I can do it. No matter how hungry I feel or how much I’m craving sugar and snacks, no matter how tired my body is and how much my muscles ache, I’m going to conquer it all because while I may be fat and I may weigh more than I should at my height and I may be physically weak, I don’t give up!